In 1918, the German mathematician Emmy Noether proved a powerful result relating symmetry and conserved quantities – quantities, such as energy, that remain constant. Her theorem is of central importance in classical and quantum mechanics. 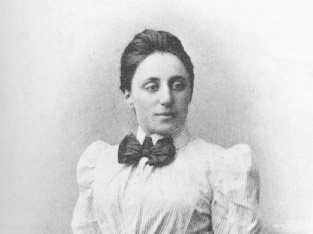 Emmy Noether (1882-1935) [Wikimedia Commons]. The branch of mathematics that formally considers symmetry is called group theory. A group is a set of elements (they may be numbers or operations) together with a way of combining them: effectively, any two group elements may be multiplied to yield a third one. For example, a square may be transformed and yet appear unchanged: it may be rotated through 90, 180, 270 or 360 degrees; it may be reflected about a vertical or horizontal line through the centre, or about either of its diagonals. These eight operations form a group: any two combine to yield another. It is called the octic group, or 4th dihedral group, and it is a beautiful object, elucidating many aspects of group theory. Groups provide a powerful, unifying mathematical concept. As the renowned mathematics writer E. T. Bell observed, ‘wherever groups disclosed themselves, or could be introduced, simplicity crystallised out of comparative chaos’. Symmetries and groups are inextricably intertwined. Symmetries come in two flavours. There are discrete symmetries such as the bilateral symmetry of a human face, and continuous symmetries like the unvarying form of a sphere as it is rotated. Discrete symmetries are associated with finite groups, those having a finite number of operations. Continuous symmetries correspond to infinite groups. There is a special class of groups that, like the elements of the periodic table, or the prime numbers, cannot be broken down into smaller pieces. These are the simple groups, sometimes called the atoms of symmetry. The octic group of symmetries of a square is not simple, but it can be decomposed into simple subgroups. One of the great mathematical challenges of recent decades has been the classification of all finite simple groups, that is, the identification, arrangement and construction of all the possible cases. This programme, called by one mathematician the ‘Thirty Years War’, was finally completed in 2004. The programme gave rise to several surprises. In addition to eighteen series of classical groups, there emerged 26 exceptional cases, called sporadic groups. The largest of these, called the Monster Group, is roughly of size 8 followed by 53 zeros, more than there are atoms in the Earth! The 26 sporadic finite groups. 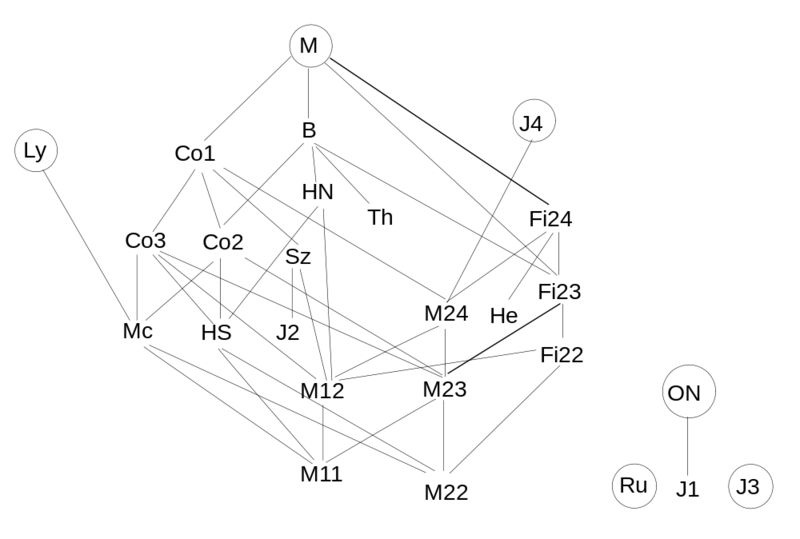 The “Monster Group”, with about 8.10^53 elements, is at the top [Image from Wikipedia]. Some amazing connections have been found between the sporadic groups and string theory, the theory that tries to unify the fundamental forces of nature. One formulation of string theory, related to the Monster Group, suggests that the Universe has 26 dimensions, not just the four classical dimensions of space and time. These connections are still very speculative, but may one day provide yet another powerful demonstration of how mathematical objects studied for their innate interest and beauty turn out to be crucial in modelling the physical world. Du Sautoy, Marcus, 2008: Finding Moonshine, Harper Perennial.